Mojave River cutting through Lake Manix sediments. 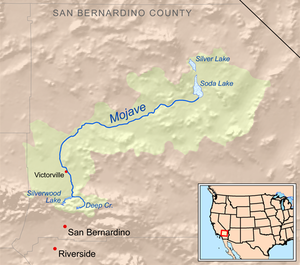 The Mojave River is an intermittent river in the eastern San Bernardino Mountains and the Mojave Desert in San Bernardino County, California, United States. Most of its flow is underground, while its surface channels remain dry most of the time, with the exception of the headwaters and several bedrock gorges in the lower reaches. A desert branch of the Serrano Native Americans called the Vanyume or Beñemé, as Father Garcés called them, lived beyond and along much of the length of the Mojave River, from east of Barstow to at least the Victorville region, and perhaps even farther upstream to the south, for up to 8,000 years. The Mohave's trail, later the European immigrants' Mojave Road, ran west from their villages on the Colorado River to Soda Lake, then paralleled the river from its mouth on the lake to the Cajon Pass. Native Americans used this trade route where water could easily be found en route to the coast. Garcés explored the length of the Mojave River in early 1776. He called the river Arroyo de los Mártires ("river of the martyrs") on March 9, 1776 but later Spaniards called it Río de las Ánimas ("spirit river or river of the (lost) souls"). In 1826 Jedediah Smith was the first American to travel overland to California by following the Mojave Indian Trail. He called this the Inconstant River. A pack horse and livestock trail, the Old Spanish Trail, established by Antonio Armijo in 1829 between New Mexico and El Pueblo de Los Ángeles, joined the Mojave River at its mouth near what is now Soda Lake. It followed the river to where the trail reached the foot of the mountains at Summit Valley and turned westward to pass over Cajon Pass and descend into the coastal valleys of southern Alta California. In 1830, Wolfskill and Yount pioneered what became the Main Route of the Old Spanish Trail, which followed a different route than Armijo, farther south just west of the Colorado River and then followed Jedediah Smith's path on the old Mohave Trail west to the Mojave River mouth at Soda Lake, to meet with Armijo's route coming south from Salt Spring. From 1847, Mormons pioneered the wagon road that became the Mormon Road from Salt Lake City to Los Angeles closely following the route of the Old Spanish Trail from Parowan, Utah. They followed the Mojave River from the Fork of the Road to the Lower Narrows, and left the river for the Cajon Pass on the route Frémont had found. In 1849 Forty-niners late on the main trail to California used the Mormon Road as a winter alternative route to California, referring to it as the "Southern Route" of the California Trail. Later emigrants to California followed the same route during the winter months. In 1855 the Mormon Road was improved and the route changed in places, becoming a major commercial wagon route between Utah and southern California, ending Utah's winter isolation until the railroads arrived there in 1869. In 1859, as part of the Mohave War, the Mohave people's trail was improved as the wagon route of the Mojave Road. It followed the Mojave River from where the Mormon Road turned north away from the river at Fork of the Road, near Daggett, to where historic Camp Cady was located. It then followed the river to Soda Lake, where the road turned eastward to Fort Mojave, and in 1862 following the gold and silver strikes on the Colorado River, to Hardyville and the mining districts near it, and its connection at the head of the toll road to Prescott and the mines in the interior of Arizona Territory. From 1863 to 1864 the Mojave River valley was a refuge from the great drought in California in those years; cattle of some resourceful ranchers of southern California were preserved by its resources. The river's source is in the San Bernardino Mountains, one of the Transverse Ranges, above Hesperia- San Bernardino. The West Fork of the Mojave flows into Silverwood Lake, formed by Cedar Springs Dam, which overflows in the Mojave River Forks Reserve area. On occasion, the lake releases water into the river. Downstream, Deep Creek meets the West Fork, forming the Mojave River immediately upstream of the Mojave Forks Dam, which provides flood control. Downstream of the dam, the Mojave River flows north and east, underground in most places, through Hesperia, Victorville, and Barstow. The water in the river is mostly underground. The channel at the surface remains dry most of the time, but extreme flooding is possible. For example, during a heavy El Niño in the Mojave Desert, rains caused the Mojave River to overflow onto overpassing bridges on 22 February 1993, the most damaged being on Bear Valley Road, where Victorville and Apple Valley are separated. The water comes to the surface only in areas with impermeable rock, such as the upper and lower narrows near Victorville and in the Afton Canyon  area northeast of Barstow. Union Pacific 844 pulls a steam excursion train crossing Afton Canyon, 2011. The Afton Canyon Natural Area is within Mojave Trails National Monument, and is managed by the Bureau of Land Management. It is located 37 miles northeast of Barstow along Interstate 15 between the Afton Road and Basin Road exits. ^ a b "Mojave River". Geographic Names Information System. United States Geological Survey. 1981-01-19. Retrieved 2011-07-13. ^ "USGS Gage #10261500 on the Mojave River at Lower Narrows near Victorville, CA". National Water Information System. U.S. Geological Survey. Retrieved 2011-07-13. ^ a b "Vanyume Indians". Digital-Desert: Mojave Desert. Retrieved 2011-01-30. ^ a b c John Charles Frémont (1845). Report of the Exploring Expedition to the Rocky Mountains in the Year 1842: And to Oregon and North California in the Years 1843–44. Gales and Seaton, printers. ^ "New Map Of The Territory Of Arizona, Southern California And Parts Of Nevada, Utah And Sonora., Payot, Upham & Company, San Francisco". Davidrumsey.com. 1877. Retrieved November 19, 2015. ^ "CDEC - Data Application". Cdec.water.ca.gov. Retrieved 2015-11-29. ^ "BLM Afton Canyon Natural Area, Barstow Field Office, Bureau of Land Management California". Blm.gov. 2015-10-02. Archived from the original on 2015-12-08. Retrieved 2015-11-29. ^ The Wildlands Conservancy: Mojave Trails National Monument, "The National Treasures at the Heart of the Mojave". ^ "Afton Canyon Riparian Restoration Project, Barstow Field Office, Bureau of Land Management, California". Blm.gov. 2009-02-19. Archived from the original on 2015-12-06. Retrieved 2015-11-29. Philip Stoffer (14 January 2004). "Changing Climates and Ancient Lakes" (.html). Desert Landforms and Surface Processes in the Mojave National Preserve and Vicinity. Open-File Report 2004-1007. USGS, US Department of the Interior. Retrieved 2009-09-12. Philip Stoffer (14 January 2004). "Playas" (.html). Desert Landforms and Surface Processes in the Mojave National Preserve and Vicinity. Open-File Report 2004-1007. USGS, US Department of the Interior. Retrieved 2009-09-12. Philip Stoffer (14 January 2004). "The Mojave River and Associated Lakes" (.html). Desert Landforms and Surface Processes in the Mojave National Preserve and Vicinity. Open-File Report 2004-1007. USGS, US Department of the Interior. Retrieved 2009-09-12. Wikimedia Commons has media related to Mojave River.